Pair of 15" Pro Audio Replacement Drivers - Model #: Seismic Audio - Quake 15, Type: 15" Woofer/Speaker , Power RMS: 250 Watts , Power Peak: 500 Watts , Frequency Response: 50-5K Hz , Sensitivity: 95 db. , Magnet: 50 oz. 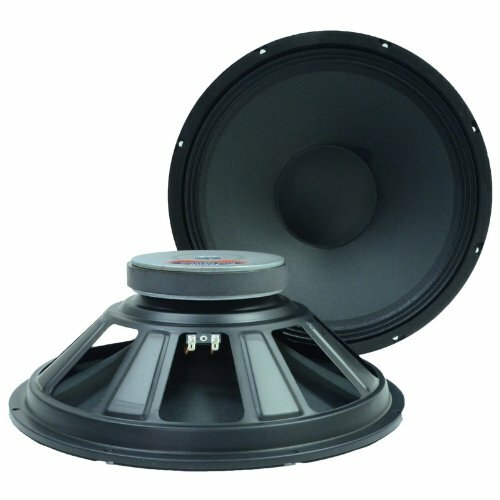 , Voice Coil: 2.5" , Impedance: 8 Ohm , Pressed Steel Chassis , Paper cone , Weight: 11 lbs. each, This speaker is brand new. , One year warranty , Listing is for a two woofers, You will receive 2 identical woofers pictured and described above. Each woofer has the specs listed above, These produce an awesome tone, with great lows and clear, clean highs, Uses include, but are not limited to: Build your own speaker cabinets Replace old woofers . Impedance: 8 Ohm. Pressed Steel Chassis. Paper cone.